Barack Obama won the presidency in 2008 partly because he was a Washington outsider. But when he got to 1600, that distinction turned out to be double-bladed. As president, Obama hoped to mount a second campaign, one for the heart of the Democratic Party and, he hoped, America, a new idology of progressive liberalism in sharp contrast to George W. Bush's aggressive conservativism and Bill Clinton's centrism. But while he'd been a brilliant campaign politician, working inside the system turned out to be much more of a challenge than Obama had ever imagined. Now, Chuck Todd takes us deep inside the White House for a gripping behind-the-scenes account of Obama's tumultous first term and campaign to win another. Drawing upon his unprecendented inner circle sources, Todd puts takes us behind closed White House and Camp David doors, on to Air Force One, through the hallways of Congress, and on the campaign trail. And not only does he give us the most intense, exciting and revealing portrait possible of this fascinating president and his struggles, Todd also seeks to define what "Obamism" really is, what the president stands for and how his decisions have changed--and will change--American politics for generations. "Todd, the newly minted Meet the Press" host and former NBC chief White House correspondent, provides an even-handed, concise, and thorough account of President Obama's first six years in the Oval Office." "Publishers Weekly""
"Richly sourced and deeply informed....There aren't many Washington journalists with the access, reporting skills, and authorial dexterity to write a comprehensive history of a presidential administration while it's still racking up miles on Air Force One. Todd delivers a surprising depth of insider reporting considering how few insiders have spoken publickly about this administration." Scott Porch, "Chicago Tribune""
"Todd is the rare Washington commentator whose on-air musings are consistently backed by authoritative reporting....He knows his subject, and he knows how to write....Readers of "The Stranger" unquestionably benefit from Mr. Todd's Beltway-insider status." Robert Draper, "Wall Street Journal ""
"Revealing....Mr. Todd has grounded his arguments in hundreds of interviews with Washington sources and his intimate knowledge of how that city works or (more often, these days) fails to work." 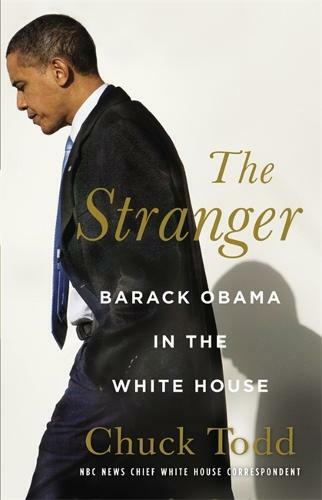 Michiko Kakutani, "New York Times""
"Todd, the newly minted "Meet the Press" host and former NBC chief White House correspondent, provides an even-handed, concise, and thorough account of President Obama's first six years in the Oval Office." "Publishers Weekly""
"A compelling, behind-the-scenes account of President Obama's first six years in office." "HuffPost Live"""